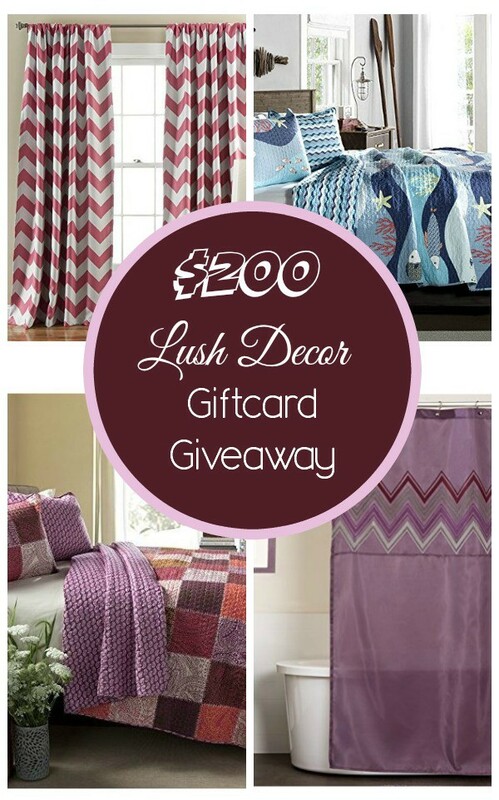 Make Over Your Home with a $200 Lush Decor Gift Card Giveaway! This post is brought to you by Lush Decor. I am receiving a complimentary item in exchange for hosting this awesome $200 Gift Card giveaway. Lush Decor is providing the gift card. Home looking a little sad after you took down all the holiday decorations? Did you resolve to spruce up your decor, maybe bring it a bit more into the 21st century? Just really LOVE new home decor? Whatever reasons you have for wanting to makeover your home, I have the perfect way for you to do it! I’m SO EXCITED (see, I’m screaming) to offer you the chance to win a $200 Lush Decor Gift Card! Lush Decor is an increasingly popular home decor company founded by Jenny Zhu. Jenny wanted to create a company that offered affordable home decor that could be enjoyed at all stages of your life. I put emphasis on the word “affordable” for a reason. That word gets thrown around a lot by many companies, but so few really understand what it means. Lush Decor offers beautiful bedding, window treatments, shower curtains and more at prices that even I find reasonable. Trust me, that’s a big deal. I balk at the price of toilet paper in my local grocery store. Take a look at what you can get with $200! Paisley Patchwork 3 piece Quilt: Comes with reversible quilt and two pillow covers. $75 for Queen, $85 for King. 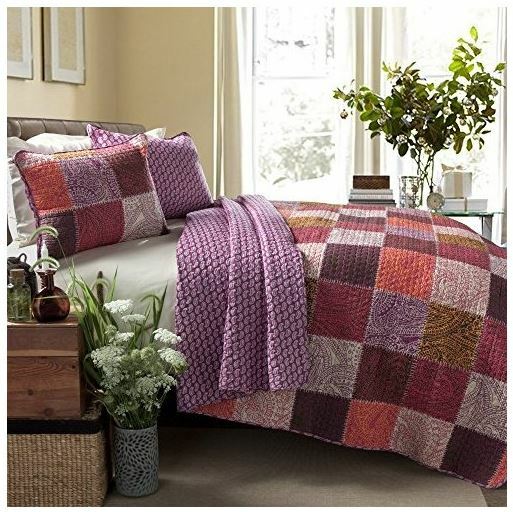 Lush Decor has many different styles of quilts and comforter sets, all reasonably priced. 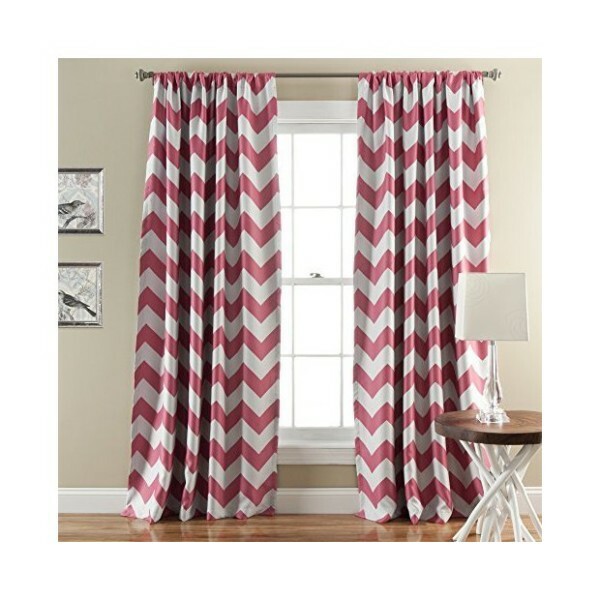 One of my favorites, Chevron Blackout curtains! $39 a pair. If you have two windows, you can grab two pairs and your total for all three of the above would come to about $183 if you shop their amazing sale. Not feeling the fun & funky color love? They also have classy, elegant, romantic and even youth home decor. It took me a good hour to decide what I wanted. I finally decided to go with something totally fun and cheery- the Sea Life Quilt Set. Enter below for your chance to win a $200 Lush Decor gift card. Giveaway is open to US residents age 18+ and ends on February 4th. Gift card will be awarded in the form of a one-time use code with no balance kept and must be used in one purchase. You can check out using Amazon.com credentials, where Lush Decor is fully integrated for convenient and secure shopping. I think that covers it, now go enter! Good luck!! There are so many wonderful items at Lush Decor! My favorite item is the quilt called Massa that comes in 3 pieces! I really like the flower drop shower curtain. I love the Crinkle 3 piece Quilt in gray, We are redoing a small 1950’s home–very square, corners, small. So we are softening the look with grays and taupes and creamy ivories. I would get the Ruffle Shower Curtain. I like the Scroll Flower 3 piece quilt set. It would look great in my spare bedroom. I am in love with the Lattice 3 piece quilt set! I really love a number of the comforter sets. My favorite is the Mia 8 piece Comforter Set and the price is really great. I like the quilt sets. My favorite is the Monique 3 Piece Blue Quilt for a King bed. I would buy the Serena 3 piece Comforter Set in king size in the color white, so pretty! I would purchase the Aubrey quilt set. I like the ruffle shower curtain! I also like the Terra window panels! I really like the Flower Drops Shower Curtain in blue. I think the Avon 3 piece Comforter Set is a beautiful set. I love the Layla 3 piece quilt set. I love all of their shower curtains, they truly are lush looking! My favorite is the Vineyard Allure Shower Curtain. They have a nice range of products! I am mainly interested in the Lux 6 piece Comforter Set. I’d love to have one of their shower curtains as well! 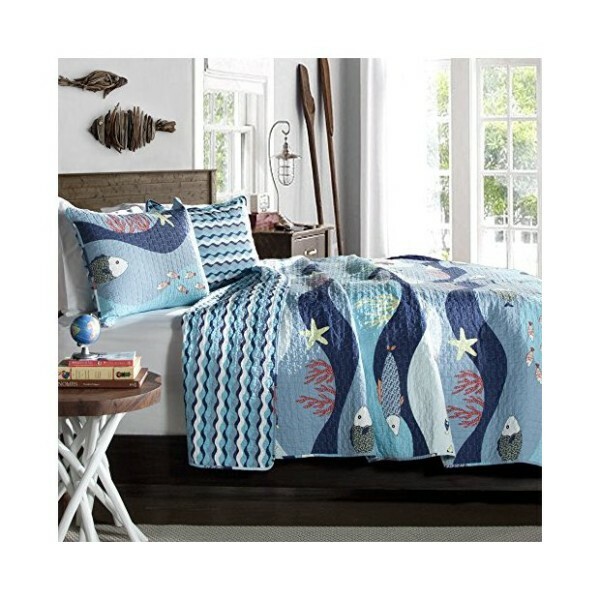 I love the Sea Life bedding collection….it would be perfect in our Florida home! I love the Lux 6 piece Comforter Set. Color Grey. This set would be perfect in my bedroom and I already have the perfect curtains this set will match out very well with. I would love to update our bedding with the Aubree 3 piece Quilt set. If I won I would love to get the Floral Paisely 3 piece Quilt. I love the Arlene Window Curtains, they would look perfect in my living room! I love the 6 piece lux comforter set. I love the Rosemonde 5 piece Comforter Set! They have so many great things for the home, and I just love the Sophie Window Blackout Curtains in blue. These would be perfect for our living room, keeping out the summer heat without making the room too dark. I really like the Boho Stripped Quilt because there is nothing better than to wrap up in a quilt on a cold winters night. I also like the Lake Como comforter set just because it looks so soft and comfortable. Crinkle Quilt Is so cute! I would love to have the Bianca comforter set. It is so pretty and would go well in my master bedroom! I love the My Valentines Day quilt sure would keep me toasty warm in my very freezing bedroom Brrr baby it’s way too cold out. I like the 4 diy gift wrap ideas I’m always “out” of wrapping paper well except for Christmas I seem to always have way too much of that since I think I NEED to buy it after Christmas when it’s on sale. I would love to decorate my granddaughter’s bedroom with the Royal Empire 3 piece Quilt as these are her favorite colors. I love the Lux 6 piece king comforter set. I would love to get the he Sea Life Quilt Set for my daughter and maybe the Mia Window Curtain for my living room. I really like the Boho Stripe three Piece Quilt Set. I love the Rosina Throw, so pretty. going through the website of Lush i found that i liked that bamboo throw i have always wanted one hope to win to get it! I would like to get the “Adrianne Throw”. I really like the Lux 6 pc comforter set. Thanks for hosting! I really like the Star 3 piece set. I’d love to get one in each color for our three oldest kids. Wow I love these colors. Not things I’d pick for myself. But these are adorable! Love the Royal Empire 3 piece Quilt, it’s exactly what I’ve been looking for! thanks for introducing me to the site! If I won I would get the Lux 6 piece comforter set in the color Grey. I love the Darla Shower from Lush Décor. It would match perfectly with the interior of my bathroom and it’s on clearance! Would love to win this-they have some really cool items! I love the Belle 4 piece comforter set! It’s so pretty! I love the Lucia comforter set in red. Royal Empire Throw is purple is so pretty and I love it. Thank you for this chance to win…. I really love the Flower Texture 8 piece Comforter Set. It’s very elegant looking while still being modern. I’d love to have the Flower Texture 8 piece Comforter Set. I love the Boho quilt set. i would like the Lux 6 pc comforter set in gray for my bedroom. I absolutely love the night sky curtains! They’d go great in our living room! I really like the Flower Texture 8 piece Comforter Set. It would be perfect in our bedroom. I absolutely love the Monique 3 piece Quilt set. I’d love buy the Paisley Patchwork 3 piece quilt! I think it’s so pretty. I love both the Darla Comforter set and the Rosamunde. Either would be perfect for my bed. I’d love to have the Lux 6 piece Comforter Set in gray with the red/burgundy black out curtains for my bedroom. I love the Lux 6 Piece Comforter Set in grey! My bed would be so pretty! I like the Darla comforter set. Very nice.Thanks for the chance. I really like the pair of stain ruffle decorative pillows. The red premium bedding is luxurious also. I would love the Sea Life 3 piece Quilt set and the Star 3 piece Quilt set! I like the Royal Empire 3 piece quilt in the blues. It would go great in our bedroom! I would probably get the Mia Curtains. I’d love to replace my sorry old bedspread with the Star 2 Piece Quilt. I like the Geo Blackout Window Curtains. I would get the Glitter Sky 7-piece comforter set. It would really make my bedroom be pretty. I love the lux 6 piece comforter set! I really like the ruffle curtains – I can see them in the guest room. I really like the Belle 4 piece Comforter Set! I would love to have the Royal Empire 3pc. Quilt Set from Lush Decor for our master bedroom. I like the Misha 3 Piece Quilt! I am in love with the Boho Stripe 3 piece Quilt. This quilt reminds me of one my grandmother used to have when I was a little girl. I would love to have the red and black Glitter Sky 7 piece Comforter Set. I really like the Mia 8-piece Comforter Set. I would love to have the Flower Texture 8 piece Comforter Set complete the look in my bedroom. I would like to have the Flower Glamour Shower Curtain in my bathroom. I love all the beautiful bedding and curtain they have! I could redo my home room!! I like the Covina Shower Curtain ,would match my bathroom perfectly. I love the curtains and need them for my living and bedrooms! I absolutely love the: Glitter Sky 7 piece Comforter Set. That deep red color is beautiful and would look sharp in the bedroom. I really like the Lux 6 pc comforter set. This would be perfect in my bedroom. Commented on iCoffee Opus: My New Single-Serve Coffee Machine Love post as Birdiebee although entry name is Terry Stevens. I’d like the Jamel Window Curtain (Pair) to keep my bedroom dark and Flower Texture 8 piece Comforter Set because it will look beautiful. I love Glitter Sky 7 piece Comforter Set. The color would pop in my bedroom. I really like the Boho Stripe 3 piece Quilt set from Lush Decor. If I won, I would get the Lydia 4 piece Comforter Set. I would really love to have the Avon 3 piece quilt set ! I like the Avon 3 piece Comforter Set. Thank You for the giveaway…we would love the Adrianne 3 piece Quilt for my daughter’s room ! I wish I did not miss this giveaway!